Do you ever have moments within your life that when you hear a certain song or watch a certain movie you immediately go back to the first time when you experienced it? Like that medium acts as a time machine and just brings you back to where you were. I find myself experience this quite often. Whenever I hear the soundtrack to Disney’s Tarzan I’m sent back to my first theatrical experience with the king of the apes. Whenever I watch Toy Story 2, I’m immediately send back to the parking lot of a Pizza Hut where my grandma has just given me the VHS for my birthday. Or play WWF’s Smack Down for the Play Station One, I am immediately at a birthday party in a bean bag chair playing as The Rock. Speaking of The Rock, how about one of his earliest cinematic outing’s in The Rundown. 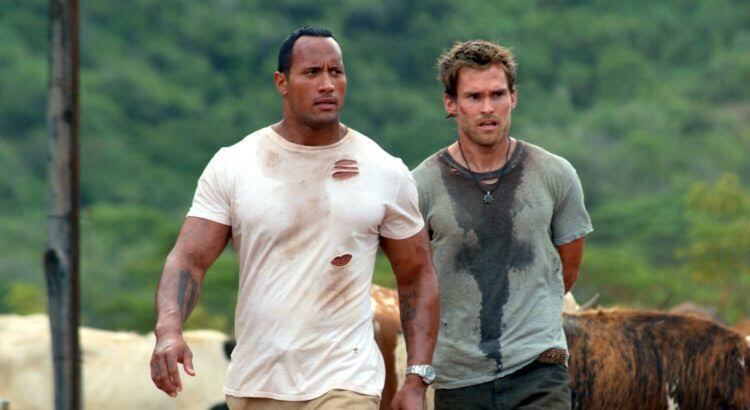 The Rundown teams Dwayne Johnson with Seann William Scott of American Pie fame. Johnson plays a bounty hunter, who dreams of owning his own restaurant, tasked with one final mission – to bring back his boss’ son, Travis, played by Scott. Only catch is Travis lives in Brazil and he is not going back without a fight. He’s something of an Indiana Jones in Brazil. That’s where the fun of the film comes along. Johnson and Scott are so well cast for this film. Their chemistry just possesses this natural progression that few other films like The Rundown possess. On one hand, you have Beck, played by The Rock, who just wants out of this life style. On the other, you have Travis, whose sole purpose throughout the course of the film is to get his hands on the much sought after El Gato. The friction between the two missions of the characters creates a colorful and hilarious dynamic that will make The Rundown a movie to come back to time and time again. Past, Johnson and Scott, however – there is also Rosario Dawson and the villainous Christopher Walken. Dawson portrays Mariana a bartender turned adventure extraordinaire, who wants the Gato to restore peace to her village. She’s noble, sarcastic, hilarious and threatening. This film allows Dawson to showcase a wide range of emotions here that not really a whole lot of other actors get to explore within this movie. Dawson may very well be the stand out of the film. Then, you have antagonist in Christopher Walken’s “Hatcher”. Hatcher is basically the guy who runs the show and enslaves the village. Here’s the thing about the Hatcher – had it been any other actor, he wouldn’t have worked as a villain. Walken manages to walk the line between camp and seriousness and he does it as only Christopher Walken can. The casting of this film is near perfection. The jungle setting allows for some pretty unique chaos. This film has everything from people half the Rock’s size destroying him in a fight, the Rock being dominated by a monkey, knock out veggies and more. Travis indeed does give Beck a run for his money but he also creates a lot of diversion from the film’s main plots. The story spends a bit too much time within the context of chaos. Ultimately, the pursuit of the Gato cheapens the film a bit when the relic falls full force within the film’s second act. It becomes so much of a plot point, you can almost forget about what Beck’s original mission was in the first place. 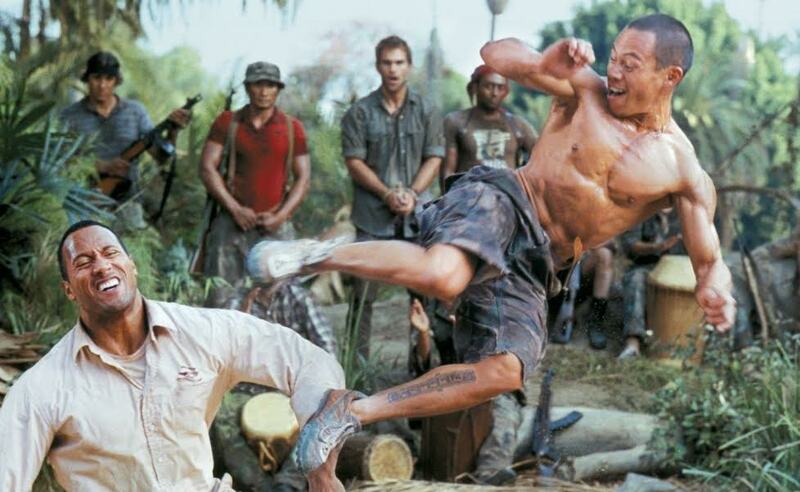 Overall, The Rundown, is a serious highlight from Dwayne Johnson’s filmography. The development of the rivalry between Johnson’s Beck and Seann William Scott’s Travis is some wonderous cinematic delight. Johnson and Scott play so well off each other and it only gets sweeter when you add in the marvelous performances from Rosario Dawson and Christopher Walken. The movie does get run down a bit from a subplot taking major focus in the second act. Despite, it’s flaws, The Rundown is pure joy and a fantastic film from start to finish.